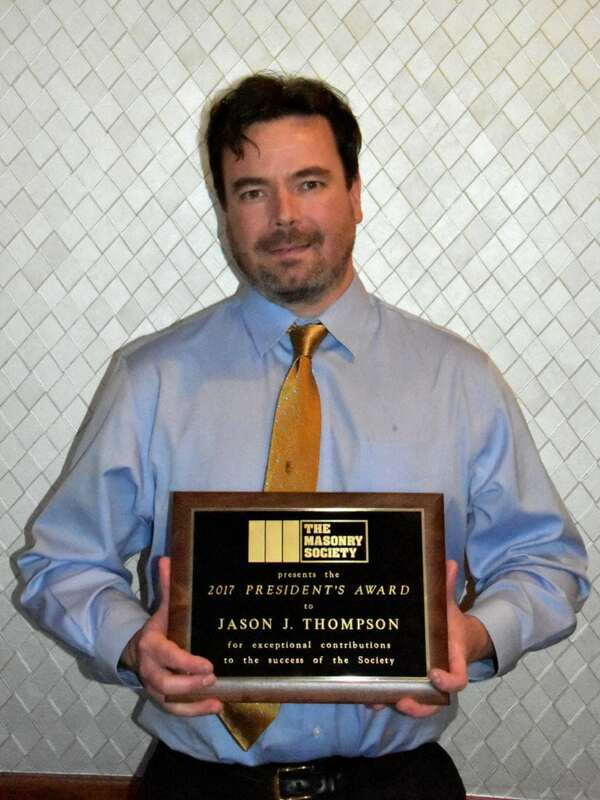 Jason J. Thompson, Vice President of Engineering at the National Concrete Masonry Association, was awarded the 2017 President’s Award at The Masonry Society’s 2017 Annual Meeting in La Jolla, California. 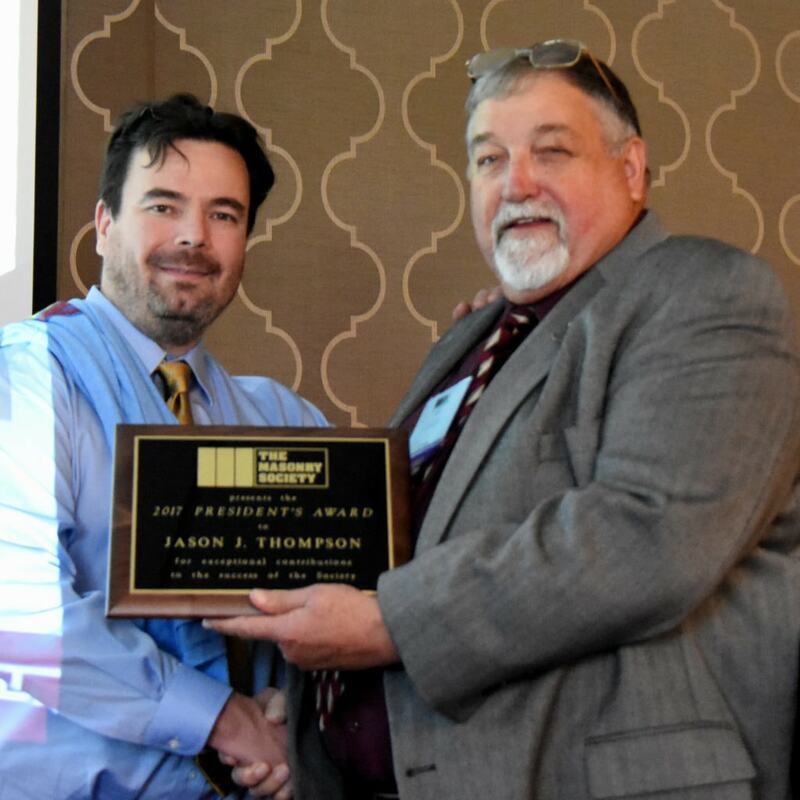 TMS President, Jerry Painter selected Jason Thompson for the 2017 President’s Award for his excellent leadership and continued exemplary service to the Society. Painter expressed his thanks to Thompson for his tireless service that includes leading several committees, serving as a critical secretary on other Committees, and serving on the Society’s Board of Directors for 6 years. Painter noted how Thompson was responsible as secretary for guiding the Cast Stone Committee, and Design Practices Committee and two editions of TMS 402/602 to completion, and without his knowledge and support, critical standards would not have been completed. Thompson is a tireless worker, and a constant promoter of the Society, encouraging people to participate and to join TMS. He has represented TMS in numerous presentations & forums. For his service, he has received 2 TMS Service Awards, and is likely the Society’s youngest Fellow Member. Painted noted that Thompson makes sure things get done, and get done well! Thompson is, as noted above, the Vice President of Engineering at the National Concrete Masonry Association. His duties and responsibilities include overseeing the technical activities of the association including research and development, design, construction, and testing standards development, design resources and tools, and providing seminars and lectures covering these subjects. Mr. Thompson is also active in the development of building codes and standards on the design, construction, testing, and quality assurance provisions for masonry structures. Thompson is active in several professional organizations including ACI, ASTM, TMS, ASCE, EERI, and MCEER. He has received several awards for masonry research and publication. He is an active member of TMS 402/602 and serves as the Chair of the Masonry Alliance for Codes and Standards. The President’s Award is made by the current President to recognize an individual who has made an exceptional contributions to the success of the Society. For additional information on the award, and to see past recipients of the Award, click here.